We are very lucky to be going on a Disney cruise later this year. We'll be sailing on the Disney Fantasy around the Caribbean on a Halloween themed cruise, which also coincides very nicely with a big birthday for me. 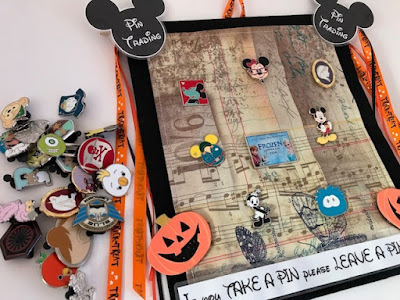 I've written before about some of the ways that you can add some magical extras to a Disney cruise, and I'm determined to join in with as much on this cruise as I can. 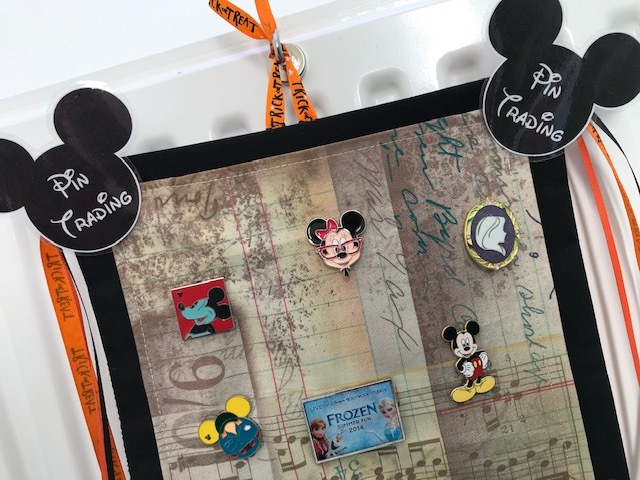 I've already signed up for an ornament exchange, a postcard exchange, and the main Fish Extender gift exchange, and I also decided to make a pin trading board to hang on our stateroom door. I must confess that I know very little about Disney pin trading. I received a few pins as part of a brand collaboration several years ago which I took with us on our last cruise. The children and I had such fun looking out for pin trading boards outside staterooms and choosing which pins to swap that I was really keen to do this again. Disney trading pins can be very expensive to buy new, but I bought a bundle on eBay of 25 for £18 including postage which I thought wasn't too bad. Many of these pins I'm going to use as part of my Fish Extender gifts, but depending on my group there will be some left to leave on the board. Of course there is an element of trust to this activity - I just hope that we end up with about as many pins as we started with! 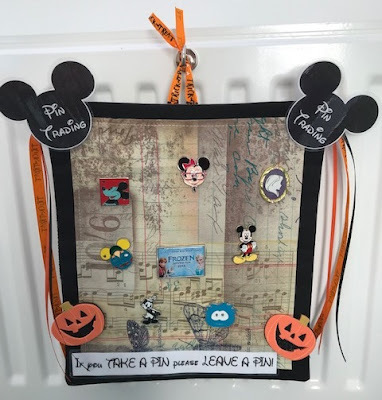 My pin trading board is made from fabric because that makes it easy to add and remove pins, and will hopefully be light enough to hang easily from a strong magnetic hook - all door and room decorations on the ship must only be held in place with magnets. I made a separate backing piece from the black fabric, which also has a layer of interfacing in the middle to give it some stiffness. There is a separate panel made from the patterned fabric which is stitched to the front, then I sewed a wooden skewer across the top to help it keep its shape and tied some ribbon to make a hanging hook. The Pin Trading signs are laminated and glued on. Because it's a Halloween themed cruise I added some foam pumpkin stickers and Halloween ribbon, which can easily be replaced if we are lucky enough to want to reuse it for a cruise at a different time of year. I do love having an upcoming holiday that I can craft for! 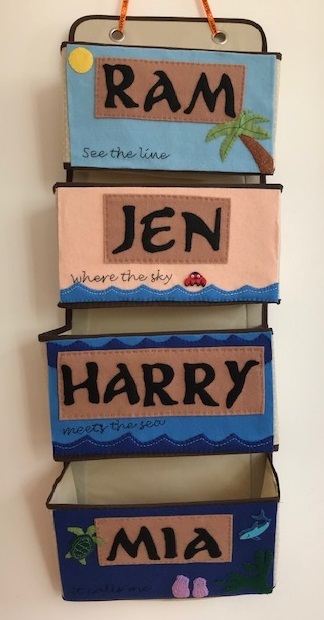 I'm also intending to sew some sort of hanging holder where I can leave small gifts like pencils and lollipops for people to take as they go past, as well as the actual Fish Extender itself which is a multi-pocketed hanger that members of our gift exchange can use to leave our gifts. It's going to have a Moana theme with a few Halloween touches - I'll share it when it's finished!